Do you primarily market to other businesses? In the 2012 Social Media Marketing Industry Report, Mike Stelzner asked marketers how they’re using social media. More than 1900 business-to-business (B2B) marketers shared their insights on what’s working with social media marketing and where they’d like to improve. In this article I’m going to focus on those areas where B2B marketers have significantly different experiences than their consumer-focused counterparts. 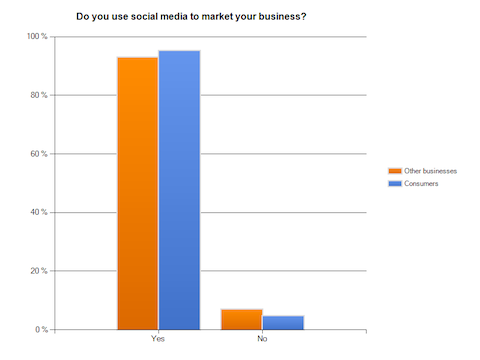 Of the B2B marketers who took this year’s survey, over 93% use social media to market their businesses. While that’s slightly below their consumer-focused brethren (95.2%), there’s been a significant increase since the 2010 survey when only 88% of B2B marketers responded affirmatively. Just over 93% of B2B marketers are using social media for marketing purposes (slightly behind B2C marketers). Based on the results of this survey, marketers from B2B brands are more likely to have 3 or more years’ experience than their B2C counterparts (18% of B2B vs. 14% of B2C). B2B marketers bring more long-term experience to social media marketing than B2C, but lag behind slightly in the 1- to 3-year category. The one area where B2B marketers significantly lag behind their B2C counterparts is in developing a loyal fan base. 63% of B2C marketers found social media helped them develop loyal fans, compared to only 53% of B2B marketers. This question was asked by over 20% of those surveyed. Businesses won’t know if they are seeing results if they don’t know how to measure their efforts. For some ideas on this, see Nichole Kelly’s article called 5 Tips for Moving Social Media Leads into the Sales Funnel. 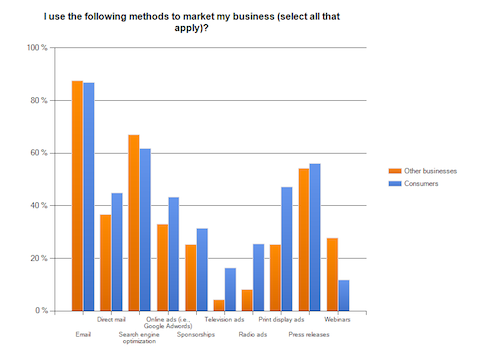 What Tools Do B2B Marketers Use? While almost all B2C marketers (over 96%) use Facebook as a marketing tool, a significantly fewer 87% of B2B brands do the same according to this study. This barely surpasses the adoption of LinkedIn (86.6%) and Twitter (84%). B2B marketers are also more likely to use blogs (65% vs. 57%) and Google+ (44% vs. 36%). B2B marketers use Twitter, LinkedIn, blogs and Google+ more than B2C marketers. I recently wrote an article showing how pervasively Facebook has penetrated the social media market. Given this, it may seem surprising to see B2B marketers valuing other platforms so highly, but these experienced marketers clearly understand where their target audience spends their time. Do you know where your audience hangs out online? Where Will B2B Marketers Invest More Time? There is little difference in how B2B and B2C marketers will increase their time investment except when it comes to Facebook, LinkedIn and blogging. In 2012, B2B marketers are far more likely to increase their use of LinkedIn. In fact, over 76% of B2B marketers will increase their use, compared to only 55% of B2C marketers. These are both increases from 2011 (71% of B2B and 51% of B2C). A significant majority of marketers will increase their use of Facebook this year, but B2B marketers (68%) lag behind B2C companies (76%). What Do B2B Marketers Want to Learn? If you offer educational products or consulting for B2B marketers, you’ll be interested to know that B2B marketers want to learn about Google+, LinkedIn and Twitter, in that order. Only in the case of LinkedIn does their interest surpass that of B2C marketers (56% of B2B vs. 50% of B2C). Only in the case of converting activities to sales do B2B marketers exceed B2C marketers in their desire to learn. It has been properly noted that many other marketing tools (like event marketing) are very social. Social media didn’t suddenly make marketers social. Nor does it replace such valuable tools as email and search engine optimization. Heidi Cohen quips that we couldn’t have social media without email; how else would you log in to all of these platforms? 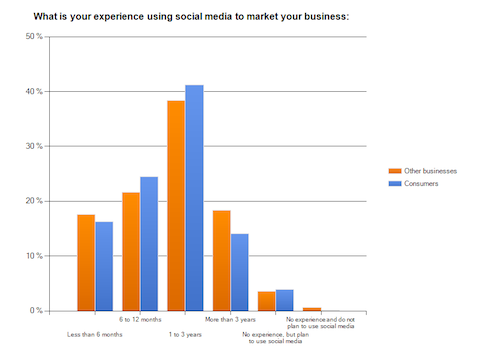 That understood, B2B marketers have a somewhat different experience marketing outside of social media. Only in the areas of email and press releases do they invest similarly. B2B marketers are significantly more likely to use search engine optimization (67% vs. 62% of B2C), event marketing (68% vs. 60%) and webinars (28% vs. 12%). B2B marketers are much less likely to use direct mail (37% vs. 45%), online ads (33% vs. 43%), sponsorships (25% vs. 31%), television ads (4% vs. 17%), radio ads (8% vs. 25%), and print display ads (25% vs. 47%). B2B marketers have very different marketing strategies outside of social media. In terms of future plans for these platforms, B2B marketers plan to increase their use of search engine optimization (69%), event marketing (62%) and email (61%). These are similar to B2C marketers’ responses, except that event marketing is far less important for B2C (51%). In studying history, one can see countless mistakes made by governments and businesses when they forget to view citizens and employees as human beings. In social media marketing it’s important to remember that other businesses are comprised of real people who behave socially (online and offline). As demonstrated by this year’s industry report, many B2B marketers have found ways to connect with their audiences. How is it going for you? What do you think? Please share your experiences and questions in the box below.